The RPA was exhited to be at the AHR Expo January 12 – 14, 2019 in Atlanta, GA. This year the Show floor exhibited 1,824 companies from across the entire industry, including 497 international exhibitors, bringing together the best in technology and product advancement. Thanks to all those who stopped by the RPA booth. The Radiant Professionals Alliance is joining PHCC's CONNECT 2019 Conference and Exhibition in Indianapolis, IN on October 2 - 4, and will host a radiant/hydronics education track. PHCC's "formula" of the best ideas, innovations and initiatives are sure to get you the inside track to racing past your competition and finishing in Victory Lane. Featuring two exciting keynoters: Richard Tretheway of "This Old House" and its spin-offs and, back by popular demand, economist Connor Lokar of ITR Economics! Full program details coming soon. 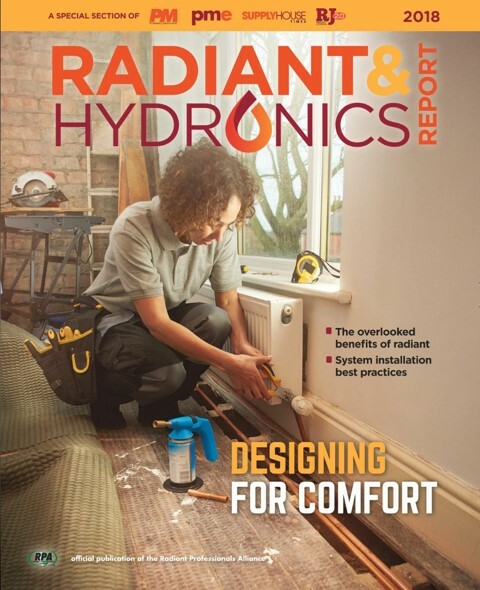 If you would like to showcase your radiant project in one of the two premier radiant publications in 2019, Radiant Living or the Radiant Comfort Report, we need to hear from you. 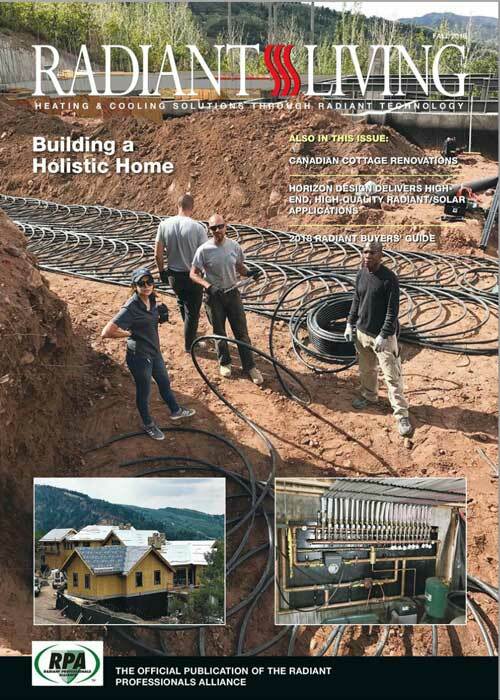 Each of these publications is bundled with a prominent magazine; Radiant Living with Contractor Magazine with a circulation of 55,000+, and the Radiant Comfort Report with Plumbing & Mechanical with a circulation of 49,000. A great way to show off your project. Please send your submissions to les.nelson@radiantpros.org. View last year's projects in the publications below. The HIA-C, a committee of the RPA, has announced the release of a new version of the free Building Efficiency System Tool™ (BEST). The BEST solves a long-standing industry issue of being able to accurately compare different styles of HVAC systems, which are all tested to different standards, with various efficiency ratings (EER, IEER, SEER, COP, HSPF), as they are applied in an actual building. The BEST 2.0 allows designers to easily comply with ASHRAE 209 Early Box Modeling requirements with the inclusion of real cost, budget and comparative energy efficiency predictions. This results in better decision-making information for prospective builders, consulting engineers, and design-build professionals about their selection options for HVAC systems during the early design, pre-build process. Get your FREE copy of BEST at www.BESThvac.org. The Service Roundtable is governed by a brain trust of the nation's best contracting companies. Accordingly, the business tools are contractor focused. They are relevant to the way contractors work today. The Service Roundtable offers the tools most contractors need, but lack. For more information about your Service Roundtable membership, please e-mail Vicki LaPlant at vicki.laplant@serviceroundtable.com or call (903) 327-3002. As always, we value your feedback. Please let us know what you would like to see in the monthly newsletters. Are they too long or too short for your liking? Any and all comments are welcome. Please send them to les.nelson@radiantpros.org. Our employee handbook/dress code does not specifically mention a man bun. This person is in sales/merchandising. Can we ask him to not wear a man bun? An employer can impose and enforce reasonable dress and grooming rules. Such an issue is not governed by any specific federal or state law, but rather generally is determined by each employer based on its objectives, and can include considerations such as the image the employer wishes to project to its customers, etc. As discussed below, such policies generally need to be uniform, and while limited gender-based distinctions may be permissible, the employer must be cautious before implementing gender-based grooming (including hair) and dress code requirements. Since 2008, the third week of October each year has been designated National Estate Planning Awareness Week. This event, held October 15–19 this year, promotes estate planning and reinforces its importance to individual and family financial wellbeing. According to a 2017 Caring.com survey, only 42 percent of U.S. adults currently have estate-planning documents, such as a will or living trust. * For those with children under the age of 18, just 36 percent have a plan. Whether or not an individual has a will varies significantly by age, with younger generations being the least prepared in the event of a premature death. So what is estate planning and why is it so important? THANK YOU for supporting our industry initiatives with your ongoing support. A& A Air Services Inc.